This text examines the impact of climate change on freshwater ecosystems, past, present and future. It especially considers the interactions between climate change and other drivers of change including hydromorphological modification, nutrient loading, acid deposition and contamination by toxic substances using evidence from palaeolimnology, time-series analysis, space-for-time substitution, laboratory and field experiments and process modelling. The book evaluates these processes in relation to extreme events, seasonal changes in ecosystems, trends over decadal-scale time periods, mitigation strategies and ecosystem recovery. 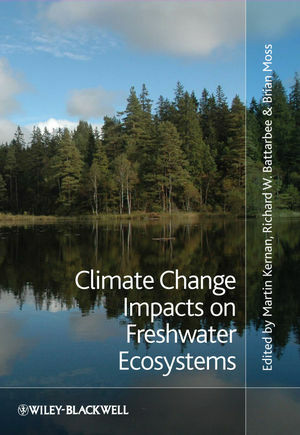 The book is also concerned with how aspects of hydrophysical, hydrochemical and ecological change can be used as early indicators of climate change in aquatic ecosystems and it addresses the implications of future climate change for freshwater ecosystem management at the catchment scale. This is an ideal book for the scientific research community, but is also accessible to Masters and senior undergraduate students. Martin Kernan is an environmental scientist at the Environmental Change Research Centre, University College London. He has worked extensively on upland lakes and streams across Europe. His current research interests include the effects of atmospheric pollution and climate change on freshwater ecosystems. He was scientific co-ordinator on the Euro-limpacs Project. Rick Battarbee is Emeritus Professor of Environmental Change at University College London with research interests in the use of diatom analysis and palaeolimnology in understanding lake ecosystem dynamics on decadal time-scales. He is a Fellow of the Royal Society and Foreign Member of the Norwegian Academy of Science and Letters. He has published over 200 research papers, including eight in Nature. He is chair of the International Paleolimnology Association and was presented with the Ruth Patrick Award for Environmental Problem Solving by the American Society for Limnology and Oceanography in 2009. Brian Moss has been Holbrook Gaskell Professor of Botany at the University of Liverpool since 1989 and a freshwater ecologist for many years. He has held posts in Malawi, the USA and UK and has taught or carried out research on six continents over forty-five years. He is an experimentalist whose current research involves eutrophication, lake restoration and climate change and, in addition to the conventional long list of papers in learned journals, he has published a well-known text book on the Ecology of Freshwaters, and a New Naturalist book on ‘The Broads’. He is also much concerned with wider global environmental problems and how art and poetry might be used to get over messages about the environment to the wider public. He has been President of the British Phycological Society, Vice-president of the British Ecological Society and editor of the Journal of Ecology, and recently was elected President of the International Association for Limnology. He was awarded the Association’s Naumann-Thienemann Medal in 2007 for his research and leadership in creating new understanding of shallow lake function. Despite all this he would want to be remembered as a non-establishment, liberated iconoclast. 1 Introduction (Brian Moss, Richard W. Battarbee and Martin Kernan). 2 Aquatic Ecosystem Variability and Climate Change – A Palaeoecological Perspective (Richard W. Battarbee). 3 Direct Impacts of Climate Change on Freshwater Ecosystems (Ulrike Nickus, Kevin Bishop, Martin Erlandsson, Chris D. Evans, Martin Forsius, Hjalmar Laudon, David M. Livingstone, Don Monteith and Hansjörg Thies). 4 Climate Change and the Hydrology and Morphology of Freshwater Ecosystems (Piet F.M. Verdonschot, Daniel Hering, John Murphy, Sonja C. Jähnig, Neil L. Rose, Wolfram Graf, Karel Brabec and Leonard Sandin). 5 Monitoring the Responses of Freshwater Ecosystems to Climate Change (Daniel Hering, Alexandra Haidekker, Astrid Schmidt-Kloiber, Tom Barker, Laetitia Buisson, Wolfram Graf, Gäel Grenouillet, Armin Lorenz, Leonard Sandin and Sonja Stendera). 6 Interaction of Climate Change and Eutrophication (Erik Jeppesen, Brian Moss, Helen Bennion, Laurence Carvalho, Luc DeMeester, Heidrun Feuchtmayr, Nikolai Friberg, Mark O. Gessner, Mariet Hefting, Torben L. Lauridsen, Lone Liboriussen, Hilmar J. Malmquist, Linda May, Mariana Meerhoff, Jon S. Olafsson, Merel B. Soons and Jos T.A. Verhoeven). 7 Interaction of Climate Change and Acid Deposition (Richard F. Wright, Julian Aherne, Kevin Bishop, Peter J. Dillon, Martin Erlandsson, Chris D. Evans, Martin Forsius, David W. Hardekopf, Rachel C. Helliwell, Jakub Hruška, Mike Hutchins, Øyvind Kaste, Jirí Kopácek, Pavel Krám, Hjalmar Laudon, Filip Moldan, Michela Rogora, Anne Merete S. Sjøeng and Heleen A. de Wit). 8 Distribution of Persistent Organic Pollutants and Mercury in Freshwater Ecosystems Under Changing Climate Conditions (Joan O. Grimalt, Jordi Catalan, Pilar Fernandez, Benjami Piña and John Munthe). 9 Climate Change: Defining Reference Conditions and Restoring Freshwater Ecosystems (Richard K. Johnson, Richard W. Battarbee, Helen Bennion, Daniel Hering, Merel B. Soons and Jos T.A. Verhoeven). 10 Modelling Catchment-Scale Responses to Climate Change (Richard A. Skeffington, Andrew J. Wade, Paul G. Whitehead, Dan Butterfield, Øyvind Kaste, Hans Estrup Andersen, Katri Rankinen and Gaël Grenouillet). 11 Tools for Better Decision Making: Bridges from Science to Policy (Conor Linstead, Edward Maltby, Helle Ørsted Nielsen, Thomas Horlitz, Phoebe Koundouri, Ekin Birol, Kyriaki Remoundou, Ron Janssen and Philip J. Jones). 12 What of the Future? (Brian Moss).